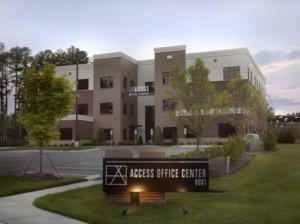 Executive Office Raleigh is the absolute perfect location for the frequent traveler. Situated just 10 minutes driving time from the Raleigh – Durham International Airport makes it ideal for any business in need of proximity to the airport. Whether you need to travel a lot or have customers flying in, the quick access over Interstate Road 540 could not be better. The facility is free standing with parking right in front of the modern building, allowing for fast access and departure. The multi-level office center offers fully serviced and furnished office suites with a shared reception, multiple conference rooms and break room area. Get the a large corporate identity feel for the fraction of the cost, permanent occupancy with short term lease agreements or virtual office plans are available at Executive Office Raleigh. Getting started is easy, just chose your preferred location, add desired services like phone answering or meeting room package to the cart and follow the checkout process. In most cases we will have your company up and running at the location the same business day. Once the set-up process is completed, our professional staff will always represent you in your companies name and attend to your every business need. Regardless if you are present or not, your customers will always have the impression of a well presented company. To visit our location, call 1.866.793.7969 or inquire by clicking the button below this description, we will arrange a tour for you with one of our managers at the business center.